Buffalo gnats and black flies… one in the same! Believe it or not, the season is still spring even though in the period from 17-31 May 2018 most days recorded temps anywhere from 7 to 20 degrees above normal. Many of those days registered humidity levels above 50 percent. Elevated temps are not easy for all animals to tolerate, cavity-nesting birds can become overheated and I suspect that birds in nests in more densely forested areas may also have trouble with the heat, as do the very young and very old (the same holds true for us humans). Then you toss in a black fly hatch in many of the same areas. SOAR has admitted 35 hatch-year 2018 raptors between 22-31 May (with more en route as I type). Many, many of these with bug bites. Rescuers reporting seeing ‘gnats’ swarming the bird’s face. We started asking questions and reading up on black flies. If you were in a nest and being swarmed and bitten by horrific bugs and the temps are hovering in the 90s… you would bail from the nest, too! More than you ever thought you should know about black flies! Black flies are also called buffalo gnats because the very tiny fly (5-15 mm) has a humped thoracic region that might look like the hump on a buffalo / bison. Black flies are true flies (Order Diptera) and classified in the family Simuliidae. I learned from a University of MN Extension entomologist that there are 30 species of black fly in Minnesota. The Purdue Extension website page about black fly notes that Illinois has 12 species of black fly while Minnesota and Wisconsin have 30 species because they have better black fly habitat. Iowa likely has somewhere between 12 and 30 species of black fly. Why does a black fly bite? The female black fly needs a blood meal. After that meal, the female lays between 200-500 eggs in one batch. Most species lay their eggs in a flowing water environment, with eggs on rocks, concrete stabilization structures, driftwood, and even aquatic plants. Black flies have a complete metamorphosis cycle with adult to egg to several stages of larvae to pupae that emerges as an adult fly to start the cycle over. The male black fly does not bite animals. Both male and female black fly will rely on nectar for energy for flight. A black fly can travel upwards of 10 miles (further on air currents) from the hatch site. When do they bite? Just like mosquitoes, black flies are most active during the dawn and dusk time. Black flies do not like windy places but are often found in low-lying areas, places with dense vegetation, and shaded areas. Black flies do not enter structures like a house. Why do black flies swarm the head? Black flies are attracted to carbon dioxide. Dark colors seem to be more attractive to black flies as well. Black fly larvae and pupae predators include fish and dragonfly larvae. So why so many stinkin’ black flies this year? The entomologist I spoke with today said that black fly populations are a springtime issue and populations will increase after heavy rain, the melting of a heavy snow pack, and sustained flooding. When questioning why black flies are here but not several counties away, you need to consider what happened up the watershed! While southern / southwest Minnesota and northwest Iowa had significant snow this past winter and north-central Iowa has received heavy rains this spring… those weather events mean more available aquatic habitat for the life cycle of the black fly. The heat and humidity are just an added twist. SOAR friend Marla rescued this fledgling eaglet on 30 May and took this photo during transfer to Kay that same day. This eaglet was rescued near a heavily wooded area along the Des Moines River, below the Lake Red Rock dam. She suspects that this eaglet fledged from a nest within the patch of timber. Notice the red dots between the eye and nares (pronounced nair-eeze and is either of the pair of nostril)? Those are fly bites. Marla reported this eaglet shaking and scratching before rescue. 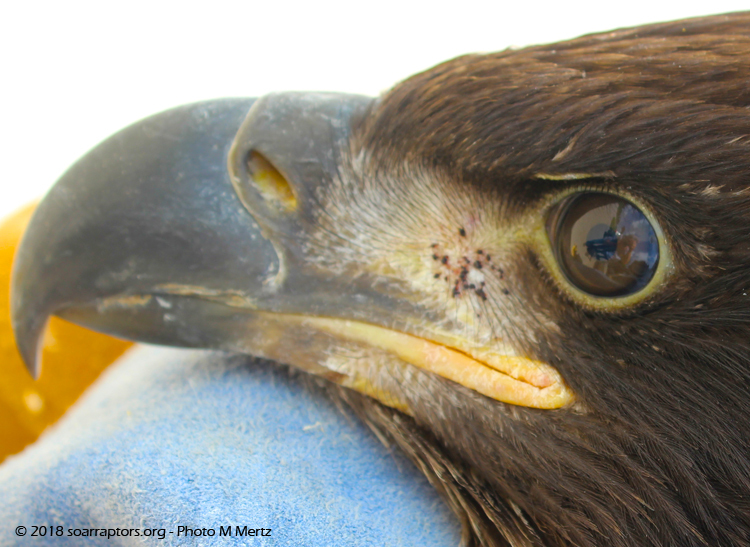 The eaglet admitted 30 May 2018 to SOAR with black fly bites on the side of the face. YUCK. The other side is just as bit up. The next day, with telephoto lens and camera in hand, she wanted to check on another active eagle nest near Lake Red Rock. She was hoping she could find the eaglets and get photos to look for evidence of bug bites. These two brancher eaglets are in a nest in an area with just a handful of cottonwood trees on the edge of ag fields and backwater of the reservoir. These brancher eaglets appear to not have bug bites. 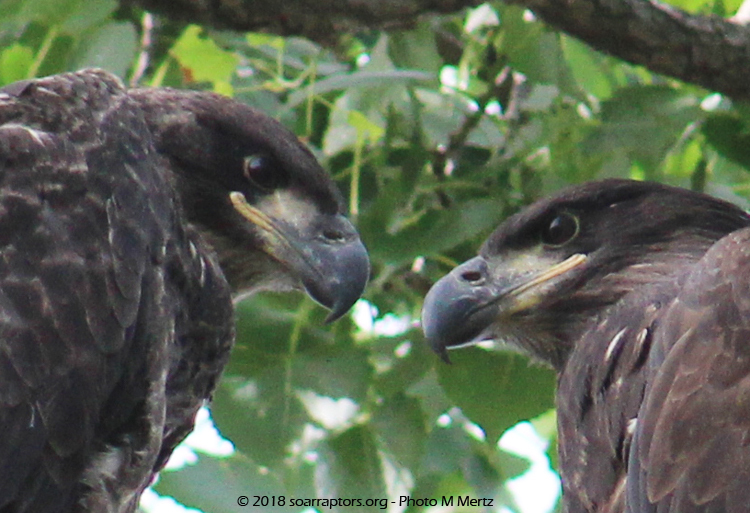 Marion County, Iowa brancher eaglets appear to NOT have bug bites on their face! When this information was relayed to the entomologist, he was not at all surprised that the nest that is more in the open and would receive much more wind and less shaded, had less to no black fly activity. 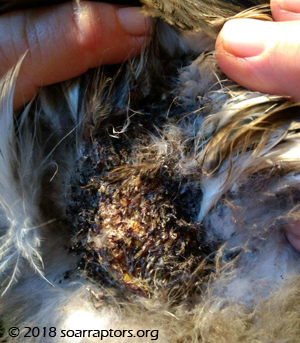 This is the damage that black fly bites can do to a bird. This is the 4 June 2018 eaglet from near Traer, Iowa. Here is a yucky photo of the damage that many black fly bites did to the eaglet admitted on 4 June 2018 from near Traer, Iowa. There were a couple of bite marks close to the eye… but the front of the neck was much more bit up.